Billionaires Bill Gates and Warren Buffett want other American billionaires to give at least half their wealth to charity.Gates and Buffett are calling their campaign The Giving Pledge. Buffett, chairman and CEO of Berkshire Hathaway Inc., said in a letter introducing the concept that he couldn't be happier with his decision in 2006 to give 99 percent of his roughly $46 billion fortune to charity. Forty American billionaires have pledged at least half of their wealth to charitable causes - a combined value of at least $125 billion.The offerings came at the request of some of the country's best-known billionaires, Bill and Melinda Gates and Warren Buffett. The trio worth a combined $100 billion convinced 40 families and individuals on the Forbes 400 list of richest Americans to sign onto their Giving Pledge campaign. Included on the list of donors, which was released Wednesday, are California hedge fund investor Thomas Steyer and his wife, Kat Taylor, who were worth around $1.2 billion in 2008.Mr. 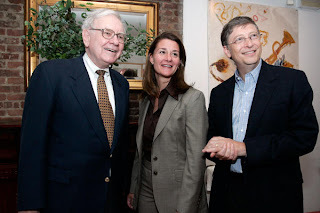 and Mrs. Gates and Mr. Buffett, first and second respectively on the Forbes 400 list, reached out to between 70 and 80 of the Forbes list’s members and around half agreed to pledge. The 40 families and individuals who have joined the Giving Pledge are worth a combined $251 billion, according to recent figures from Forbes. I really salute these two world's richest man and world's best philanthropist for their care about charity work. They almost donated all of their wealth to charity instead giving it to their children. Their philosophy is give enough to children so that they are able to work themselves with the available resources. How about us whose are not rich like them? Can we also donate something to charity? Yes, we can! We are not rich like them but we also possess talents and gifted skills. We can do charity in the form of rendering our service, time, energy and talent to the needy community. What ever good work you done, it counts in God's mind. The more you give to others, the more blessing will pour upon you. One of the way to gain financial prosperity is to give first. Not everyone can manage HUGE MONEY! Big, Bigger, Biggest,.........Really very BIG!